This artist concept shows K2-138, the first multi-planet system discovered by citizen scientists. The central star is slightly smaller and cooler than our Sun. The five known planets are all between the size of Earth and Neptune. 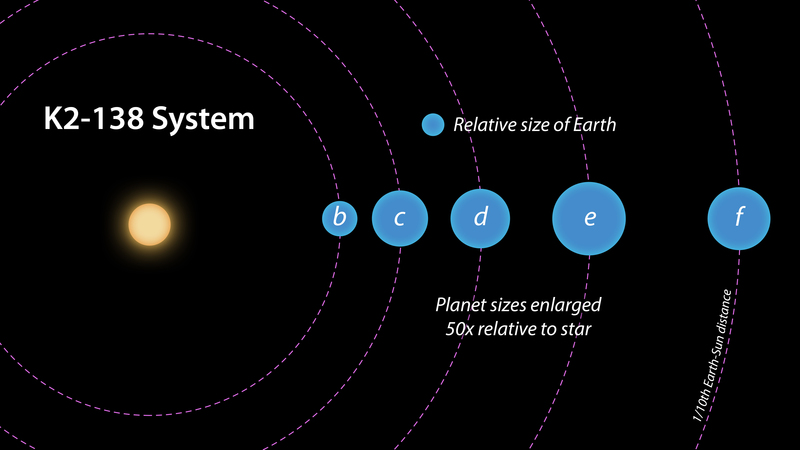 Planet b may potentially be rocky, but planets c, d, e, and f likely contain large amounts of ice and gas. All five planets have orbital periods shorter than 13 days and are all incredibly hot, ranging from 800 to 1,800 degrees Fahrenheit. NASA Ames manages the Kepler and K2 missions for NASA's Science Mission Directorate. JPL managed Kepler mission development. Ball Aerospace & Technologies Corporation operates the flight system with support from the Laboratory for Atmospheric and Space Physics at the University of Colorado in Boulder. For more information on the Kepler and the K2 mission, visit www.nasa.gov/Kepler. For more information about exoplanets, visit https://exoplanets.nasa.gov/.